There are two really big matches this weekend, and they’re both on Sunday. 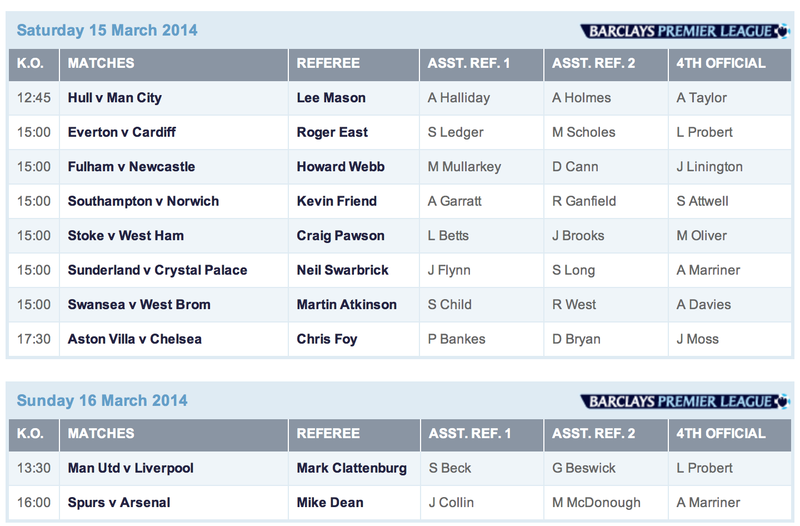 Mark Clattenburg will come off his Champions League match this week to officiate Liverpool v. Manchester United. The outcome of that game will have a major impact on the standings, so it makes sense that Clatts – who’s been at the top of his game of late – gets the call. He has his own history with David Moyes’ teams facing Liverpool, of course, even if Moyes is now with Manchester United instead of Everton. So it should be interesting. As for Liverpool, I think we can all agree they’re just glad it’s not Howard Webb. Mr. Dean is a little card happy; he has 68 yellows and four reds in only 19 matches. (Only Andre Marriner has given more red cards.) I’ll give Dean the benefit of the doubt, but I ain’t gonna lie to you…I wish the appointments were reversed. I guess there’s just not enough Clatts to go around. It also bears noting that Michael Oliver, who had a clanger last week, is not taking a match himself – either in Premier League or Championship. Mr. Oliver is taking a little break and hanging out with the equally young-looking Craig Pawson as his fourth official. Probably best for everyone.